The propeller-bladed regional aircraft manufacturer ATR announced that it has obtained certification for the very latest innovations developed for the avionics of the ATR 42-600s and ATR 72-600s from the European Aviation Safety Agency. The new certification concerns the LPV (Localizer Performance with Vertical guidance), RNP-AR 0.3 (Required Navigation Performance with Authorization Required) and V-NAV (Vertical Navigation) approach functionalities coupled to the autopilot. These new improvements will allow the latest generation ATRs to follow more accurate and even more secure approach trajectories thanks to satellite navigation, without requiring ground-based navigation facilities. 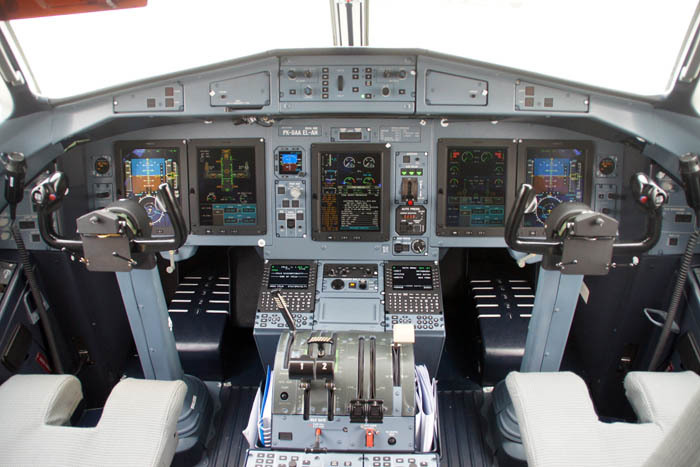 These new features, which significantly reduce the pilot’s workload, are integrated into a new version of the ATR -600 avionics, the “Standard 2” version. “LPV” is a feature allowing approach procedures based on GPS information augmented by geostationary satellites, which allows the aircraft to be guided on vertical and horizontal axes, without the need of support from a ground station. This new feature is particularly useful for airports not equipped with an ILS (Instrumental Landing System), notably certain regional airports which are small or which have little infrastructure. High precision LPV approaches can achieve minimums of up to 200 feet, thus permitting landings with greatly reduced visibility. “RNP-AR 0.3” allows aircraft to follow trajectories with greater accuracy, thus with better anticipation of potential obstacles when approaching difficult to access airfields. The fundamental contribution of RNP-AR compared to conventional RNAV (GPS) approaches is that they are subject to increased monitoring of aircraft performance combined with onboard navigation alerts. By taking into account these safety constraints, these approaches also permit reduced minimums compared to conventional RNAV approaches. In addition to these advantages, this new feature is also used in the management of traffic at heavily congested airports or for anti-noise procedures. “VNAV”, coupled to the autopilot, provides vertical guidance managed by the aircraft’s navigation calculator (FMS). Based on the calculations of the FMS, the autopilot controls the aircraft to follow a specified vertical profile. This more accurately defines descent and approach trajectories, providing better safety in relation to the possible presence of obstacles. VNAV significantly reduces the workload of pilots approaching airports; this functionality is essential for RNP-AR operations.